Overall, I found this serial to be a tad disappointing; however, it has some brilliant moments that raise it up from the level of banality. Professor Watson’s phone conversation with his family — a really wonderful scene. The man knows that, barring a miracle, he’ll be dead in a few minutes. Naturally, he wants to connect with his family. He keeps the conversation low-key and doesn’t let on what’s really happening, but lets his affection for his wife and children show. That way, if all goes well, no one is unnecessarily alarmed; if the worst happens, his family will realize that he was saying good-bye to them. The “female” Eldrad – what can I say? I mean, wow! And well-acted. She’s so very shrewd, and vastly superior to the “male” Eldrad. (I’m using quotes because I doubt if the Kastrians really had genders) How did the change from “female” to “male” turn Eldrad into a ranting idiot? Wait! Don’t answer that! Sarah’s, um, peculiar outfit. The 70’s produced some strange fashions, but I don’t remember anything quite like that. Not for an adult, at least. Sorry, but I just can’t get scared of that hand. It reminds me of Thing from The Addams Family TV show. I kept expecting Morticia or Uncle Fester to make an appearance. Thing wouldn’t have liked that plastic box, by the way. He (it?) preferred wood. I find it strange that someone can order up a nuclear strike by phone, like placing an order for a pizza delivery. And while we’re on the subject of nuclear bombs: Expecting a nuclear strike at any moment? No problem! Just hide behind a truck, plug your nose and open your mouth. Sure, the radiation will kill you if the blast doesn’t, but at least you’ll have intact eardrums. More nonsensical stuff: Professor Watson, who has, up to now, displayed intelligence and common sense, suddenly goes haywire and tries to kill Eldrad with a gun. I guess, back then, no DW story was complete without someone shooting at a bullet-proof alien. Good-bye to Sarah Jane, one of the Doctor’s best companions. “Hand”, as a whole, leaves something to be desired, but one can’t complain about this scene. Here’s the Doctor, receiving the “call” to return to Gallifrey; he doesn’t try to resist, as he did before. He knows he must go, and he knows what happened to his human companions the last time. Clearly, Sarah must stay behind. Their conversation has little overt emotion; it’s wonderfully underplayed, but the feelings show, none-the-less. Well-done! The dog was a nice touch. This being DW, one might expect this lazy pooch to start talking, or sprout wings, or do something else that shouts “I’m an alien!” But he does no such thing, he’s just a normal dog who was enjoying a nice nap in the sun, and is a little irritated at being disturbed by this strange human. Sarah eats a banana as the Doctor and Eldrad prepare for departure. 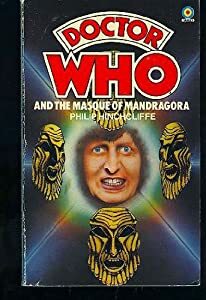 I liked “Masque” a lot. Visually, it was a delight, and the plot had an interesting three-way power struggle (Giuliano, Hieronymous, and Frederico). I give it a 4 out of 5. The Doctor encounters a group of peasants eating their lunch by the side of the road. The town marketplace has a lot of foodstuffs for sale: round bread loaves, baskets of apples, onions, lemons, and artichokes. (My notes include another item that looks like “angry birds”. I don’t think that’s right.) There’s also baskets of grain, one of which the Doctor knocks over. When Giuliano consults with the Doc and Sarah, there’s a table laden with refreshments. These include a plate of almonds, a loaf of bread, and a bowl of fruit. The Doc eats some of the nuts. I have a note that the count eats some grapes from a bowl of fruit, but I don’t remember what scene it’s from. From episode 3: The count pours himself a cup of wine. From episode 4: The Doctor requests a salami sandwich. As he and Sarah depart, the Doctor is carrying a large salami.